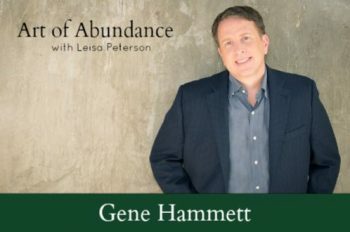 Today’s guest is Gene Hammett – Gene and I met several years ago at a marketing conference and we quickly discovered we shared similar philosophies about business. Listening to him share what it was like to lose $3 million dollars in a business deal — how it came about and what he did to get through the crisis may surprise you. Gene shares how he overcame this difficult situation and how he’s channeled his experiences into helping companies experience rapid growth through leadership. You’ll also hear about why Gene was recently named as one the best motivational speakers and what unusual things he’s done from the stage to captivate his audiences. Gene Hammett is a leading expert on high-growth company culture and leadership. He has decades of experience with more than $40 million in revenue for the companies he has led and owned. Gene has interviewed more than 300 CEOs of high-growth companies to understand the core principles of fast growth. He consults companies to activate new growth and reduce the high cost of ineffective leadership. After 15 years of being a serial entrepreneur, Gene has built teams and taken many companies to two times and three times growth. He has worked with seven companies on the Inc 5000 list. Recently he realized the biggest driver to fast growth was the ability for companies to create a growth culture and leadership that inspires ownership. Gene is the best-selling author of The Trap of Success, a book about breaking through to new levels of growth. He writes a weekly column for Inc Magazine. Since 2014, his show, Leaders in the Trenches, has been recognized by Inc., Business Insider, and Entrepreneur for its insight on growth and sales leadership. The post AALP 219 – Fueling Growth with Gene Hammett appeared first on Wealth Clinic.